How Long Does It Take for a Bamboo Seed to Grow? Where Does the Bamboo Plant Come From? Is Bamboo Wood or Grass? Examine the stalk. The stalk is where you will take your cutting. Chose a stalk that looks healthy and shows no signs of yellowing or spindly growth. The stalk should be large enough to lose a 4-inch cutting without sacrificing more than one-third of it's height. Locate your bamboo plant's node. The node can be located in two ways. The easiest way to is find the rings that encircle the stem. Just above one of these rings is where you will take your cutting. The other way to locate the node is to mark the place just above the stems where leaves emerge from the stalk. Use the right equipment. You want sharp, clean pruning shears. Jagged edges or dirty instruments can damage the plant or introduce bacteria to the freshly cut stalk. This is essential to the health of your plant and the success of your cutting. Position your pruning shears so they surround the stalk at an area just slightly above a node. Clip the stalk with one quick motion and collect your cutting. Dip the bottom end of your cutting in powdered or liquid rooting hormone. This is optional, but it encourages your cutting to throw off roots more quickly, giving the plant a better chance of developing into a plant of its own. Plant your cutting. You can grow bamboo in water or soil. Bamboo seeds germinate in 14 to 28 days. Seedlings grow to a height of 4 inches or more in the first month. Put the bamboo where it will be in bright, but indirect light. Although the bamboo plant will grow in shade, it will do better with a few hours of light each day. Avoid putting the bamboo plant on a windowsill, or in hot afternoon sun. Regular room temperatures will be fine for the bamboo plant. Change the water in the bamboo's container at least once every week, using bottled water, and keep the water at approximately the same level. If you use tap water, let the water sit out overnight so additives such as fluoride and chlorine have time to evaporate. 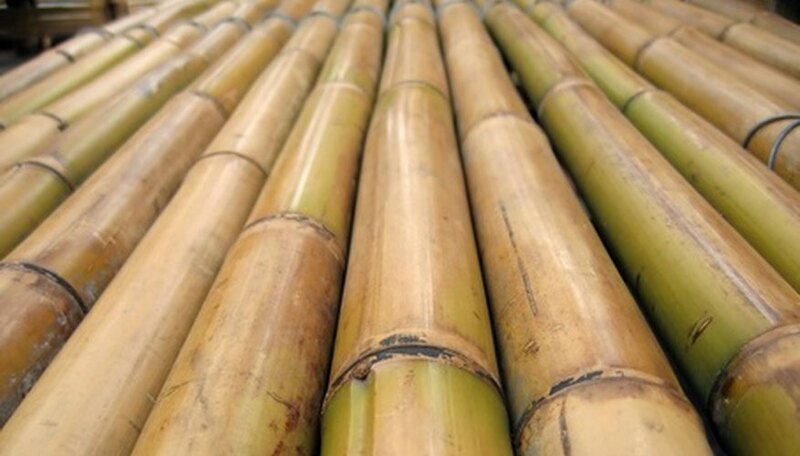 Over time, a buildup of these chemicals can damage the bamboo plant. Add a drop of liquid houseplant fertilizer to the water once every other month. The bamboo will grow well even without fertilizer, so if you occasionally forget, the plant won't be adversely affected. Feed your bamboo plants a lawn fertilizer high in nitrogen with a formula of 21-5-6. A time-release palm and ornamental fertilizer with a 13-3-13 formula also will work. Spread a 2- to 3-inch layer of compost or aged manure around the base of your bamboo for a more natural source of bamboo food. Mulch is beneficial to the growth of bamboo plants and helps them retain moisture. Feed your bamboo plants with water from a fish tank or fish pond. The waste in fish-tank or pond water is natural food for the bamboo. Similarly, add a few drops of aquarium plant food to your bamboo plants' water once a month. Place your lotus bamboo in partial, dappled sunlight. Maintain air temperatures around the lotus bamboo plant of 65 to 95 degrees Fahrenheit. Keep the water level in the lotus bamboo pot or vase at no more than 1 ½ to 2 inches. Replace the water once every week, using non-fluoridated distilled water. Don’t add more than 2 inches of water to prevent the canes from rotting. Feed your lotus bamboo a high-nitrogen liquid fertilizer once every two weeks during the spring and summer. Apply the fertilizer when you’re replacing the water and follow the fertilizer directions on the label. Prune your lotus bamboo in the fall and winter to remove all the dead leaves with sharp scissors. Thin the stems in the winter, removing about one-third of them with pruning shears. In early spring or late winter, before new growth emerges, cut back the stems by one-quarter or one-third of their height. Dig up bamboo using a shovel, garden hoe and mattock. This process is known as grubbing out a plant. Dig out any remaining roots with a garden rake. Watch for any emerging bamboo that will spring up from roots that you may have missed. Treat bamboo shoots with a broad spectrum herbicide containing glyphosate. Do not delay treating young shoots. The older shoots become, the more resistant they grow toward herbicidal treatments. Pour boiling water over new shoots to kill them for a more organic method than herbicide. Wait for young shoots to die and turn brown. Dig up the dead shoots and rhizomes. Mow any remaining new shoots down to the ground using the lowest setting on your mower. Mow over bamboo patches once weekly, as often as you mow your lawn. Pot your bamboo in rich soil. Potted bamboo plants require nutrient-dense potting soil and grow best in a slightly acidic environment. Be sure the soil drains well and place a layer of rocks on the bottom of the pot for additional drainage if needed. Water regularly. 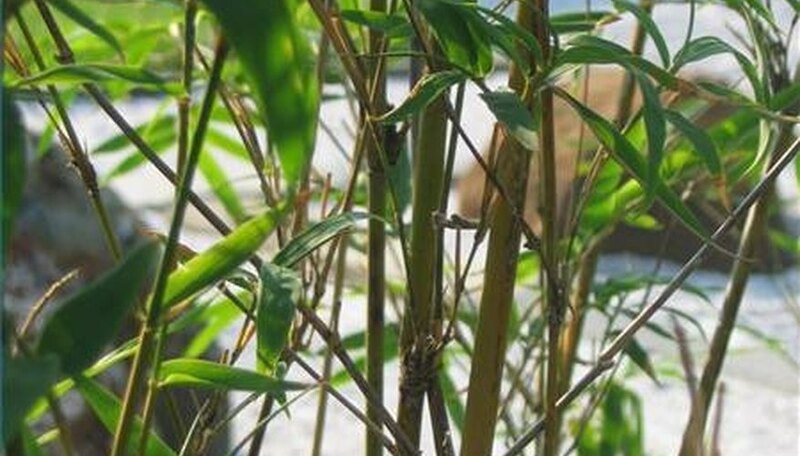 Bamboo plants are water-hungry and should be watered as soon as the topsoil becomes dry. Take care not to leave the plant in standing water. Mist your plant daily. Bamboo flourishes in humid environments and enjoys water spray. Use a spray bottle to lightly mist your plant and encourage new growth. Place in full sun. Bamboo plants need lots of sun to be healthy but can tolerate partial shade. Choose a sunny location to keep your bamboo plant in and adjust the location if needed. Remove dead or yellow leaves. Regularly inspect your plant for dying or dead leaves and pinch them off at the base of the stem. Find a suitable location for the Japanese bamboo that has average or slightly acidic soil with full sun, although Japanese maple is shade-tolerant and able to adapt to other conditions. Plant the seeds under a thin layer of soil in early spring after the last frost or bury a segment of root about 4 inches underground. Water the Japanese knotweed regularly, keeping the soil moist but not wet. The plant is somewhat drought resistant but prefers wetlands and other places with abundant water. Allow the Japanese bamboo to die off at the end of the year. It will naturally spread and regrow with the next growing season. One of the simplest items that can be made from bamboo is the simple fishing rod. Bamboo can also be found in sailing boats, sailing rafts, and skateboards. 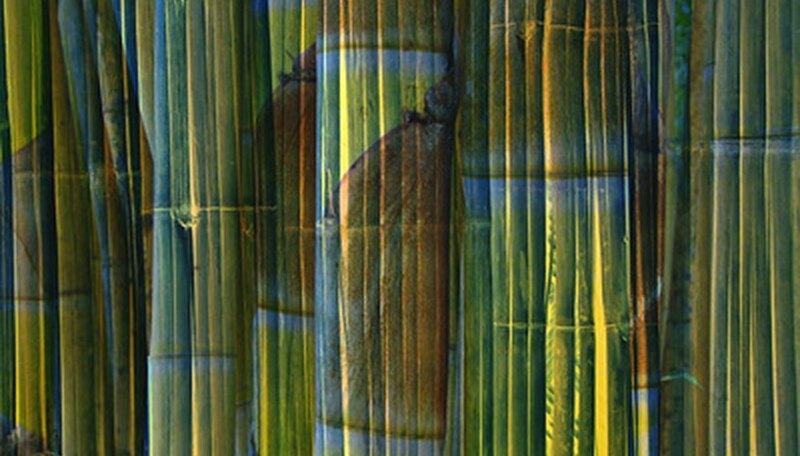 Presently bamboo is being explored as a lightweight material for bicycle frames and trailers. Bamboo poles have been used as framing materials in the tropics for years. It can now be found as flooring. Presently it is being explored as a strength builder for composite materials. Epoxy is mixed with short bamboo fibers and poured into the shape of the needed material. 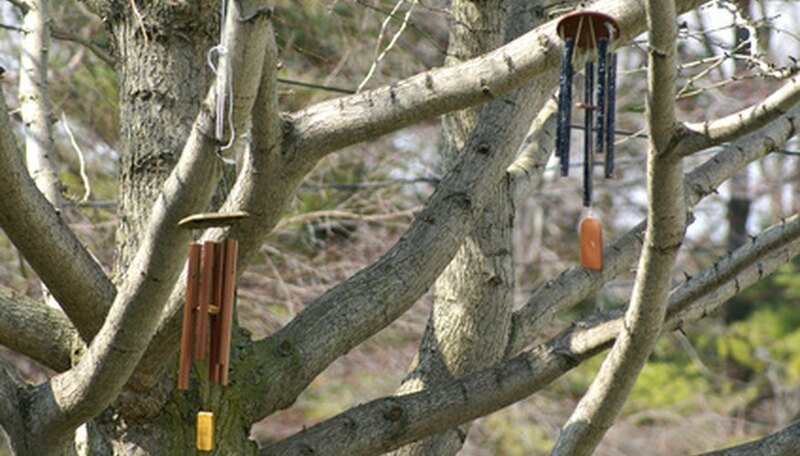 Musical instruments that can be made of bamboo include digeridos, pipe organs, flutes, panpipes, rainsticks and windchimes. Bamboo in the landscape can create a living fence. Traditional fencing can be made from bamboo poles tied together. 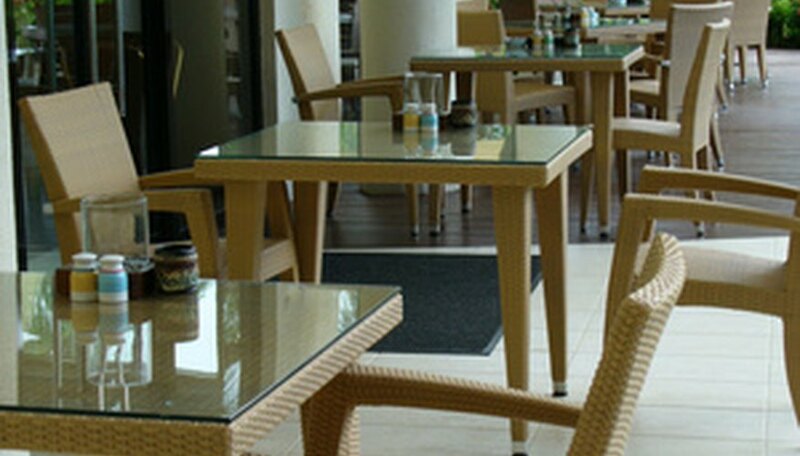 There does not exist any type of furniture that can not be made from bamboo. This includes tables, chairs, beds and even desks. 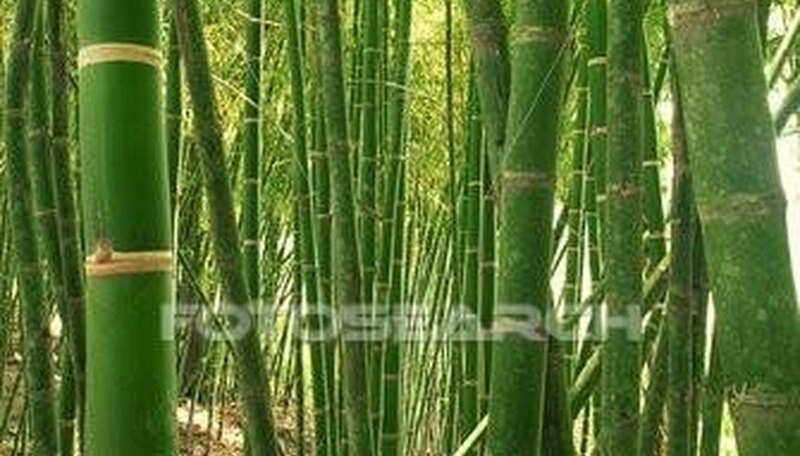 Bamboos number 1,200 species, placed into 90 similar groups called genera (singular genus). Members of the grass family, they range from tall timber-like plants to short ground covers. Bamboos grow in both temperate and tropical regions of the globe, from 50 degree North latitude to 47 degrees South latitude. Clumping tropical bamboos are in stark contrast to the running, invasive-rooting types more commonly native to temperate regions. There is a bamboo species adapted from coastal lowland to mountainous habitats. The Asia-Pacific, which includes Australia, is home to roughly 800 bamboo species. In China alone there are 400 native species. North and South America combined contain about 500 species of bamboos, and demonstrate the greatest diversity in bamboo native habitats. Many bamboo native to the Asia/Pacific region also occur in the tropical areas of Africa. There are 10 species on the African mainland, while the island of Madagascar is home to 11 native bamboo species. Although no species of bamboo extant today are indigenous to Europe, it is worth noting that bamboo is speculated by some paleobotanists to have grown in Europe until the last Ice Age. Decide which bamboo variety you want to plant outside in your landscape. There are over 1,200 different varieties, so find one that works best for your region and climate. Keep in mind that there are varieties that favor climates that range from arid to below 0 degrees F.
Plant the bamboo outside once it is above 40 degrees. Make sure the area where you are planting it is prepared properly, whether in the ground or a planter box,. It needs to have well-drained, good quality soil that is able to stay consistently moist. Dig a hole that is as deep as the bamboo's container using a shovel. Make the hole twice as wide for the rapid growth the bamboo will bring. Place the bamboo plant into the hole after removing it from the container. Space bamboo plants at least four feet apart. Backfill the holes with soil and mulch. Water the bamboo deeply after planting and filling up the hole. Water the bamboo plant consistently to keep the soil moist but not in puddles. Grow your golden bamboo in a wood container or unglazed terra-cotta pot measuring at least 24 inches deep and wide. Unglazed pots are more porous and will help insulate the bamboo roots from heat, according to Austin Community College's biology department. Place the pot on an impenetrable surface, such as concrete or a deck. Check the bottom of the pot periodically to make sure the roots aren't blocking the drainage holes or otherwise escaping. Place a 1- to 2-inch layer of mulch on the soil around the base of the bamboo. This will help keep the soil cool on hot days. Water the golden bamboo three times a week during the summer. If temperatures are over 90 degrees, you may need to water five days a week. Keep an eye on the moisture content of the soil, and if it appears to be drying quickly, give the bamboo some water. 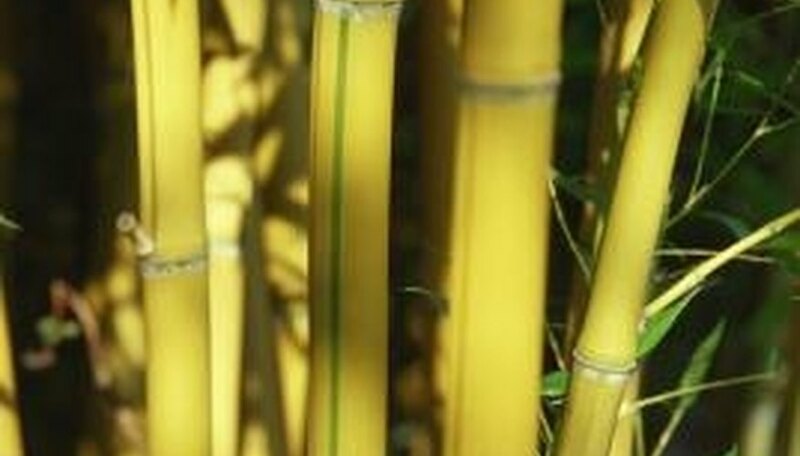 Fertilize the golden bamboo once a month with a 17-6-2 slow-release fertilizer. Follow the label directions for dosage. Water after fertilizing. Till the soil, removing all weeds, and amend it with garden compost so that it is loose and drains well. Dig a hole larger than the young bamboo plant's container. Carefully remove the plant from the pot, place it in the hole and cover with compost. Water thoroughly. Water the young plants in their first year so that the soil around them is moist but not sodden. Put mulch around the base of the plant to increase water retention. Support the growing bamboo with garden canes, attaching the plants to the canes with twine. Tie the twine loosely so that the plant has plenty of room to grow. Feed the bamboo with a general purpose fertilizer during the growing season, following the manufacturer's instructions. Determine the stalks you want to cut. Clumps of bamboo are usually one single plant connected underground. You will need to separate what you want to cut from what you want to let grow. Dead or dying stalks should also be removed. Notice the diameter of the stalks you wish to cut. Stalks less than 3 inches in diameter can be cut using a hand saw or heavy lopper. Anything larger requires a chainsaw. Find the lowest node on the stalk you wish to cut. This is a horizontal ring located every few inches on each bamboo stalk. 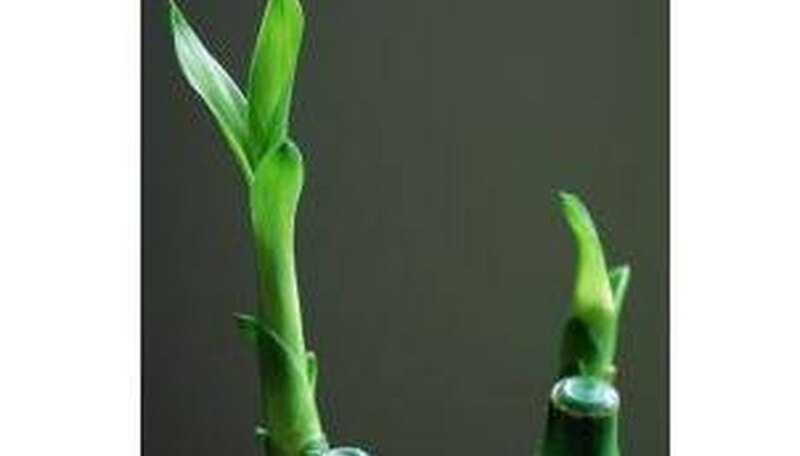 The lowest node will depend on the height you want your bamboo plant to be after cutting. Use your saw to cut down the bamboo plant. Cut just above the lowest node with slow, repetitive movements so as not to crack or splinter the wood. Repeat until each stalk is cut down. If using a chainsaw, you can cut multiple stalks at once if they are located close together. Bamboo grows anywhere from one foot to over three feet per day, depending on the climate and growing conditions. One technique is to dig out the bamboo with a spade, making sure to remove any underground rhizomes, as these will sprout into new plants if they're left in the ground. The Alabama Cooperative Extension says this method is ideal only for small stands of bamboo. For larger stands, cut the bamboo down. Texas A&M University recommends waiting for the plant to grow approximately 2 feet tall, then trimming it to the ground. Repeat until the plant dies. The university reports that repeated cutting will starve the bamboo's underground food reserves and kill even well-established groves. Another alternative is to spray the bamboo with herbicides. This is ideal for those who want a faster method of bamboo eradication that doesn't require repetitive physical labor. The only effective herbicide treatment for killing bamboo is spraying diclobenil in the winter and glyphosate in the summer, according to North Carolina State University. The former helps kill the bamboo's underground rhizomes, while the latter keeps any surviving rhizomes from regrowing. Arrange your bamboo sticks in the middle of a bowl or vase. Place about 2 to 3 inches of river rocks at the bottom to anchor the sticks. Wrap small gardening wire around the arrangement to hold it in place. It should be tight, but not tight enough to cut the bamboo. Fill your bowl or vase with water to cover the rocks. Tap water will suffice as long as it's drinkable. If not, use filtered or spring water. Keep your bamboo sticks in water at all times. If you use a clear bowl or vase, you'll be able to tell when the water is low. Change your water weekly. This helps keep the water clean. Keep the bamboo sticks out of direct sunlight. A small amount of indirect light is fine, but direct sunlight will cause yellowing leaves and eventually kill the plant. Pluck off yellow leaves when you first notice them. Use your fingers to do this rather than scissors or clippers. Measure the desired picture size in the center of the clear plastic sheet and mark out the space with a permanent marker. Measure, mark and cut the bamboo stems to fit around the sides of the frame. The bamboo should be formed to fit vertically around the entire frame. Apply silicone sealant outside of the marked area on the plastic sheet. Place the bamboo stems around the frame and press them firmly into the sealant. Paste the correct size of matting to the back of the picture frame to give the frame a finished appearance. Miter-cut two bamboo pieces and glue them to the back of the matting as the back stand. Choose a variety of bamboo to grow best in the setting where you will grow them. With such a large variety to choose from, you will find an ideal bamboo for your climate and yard size. Dig up and loosen the soil in the ground area where you will grow your bamboo. Since the bamboo will be grown in the shade, make sure there are tall trees around the area to block the sun. Bamboo is a shade tolerant plant. Make sure the soil is rich and well draining. Remove all weeds and other plant life. Dig a hole, and then fill it in with the prepared soil. Plant the bamboo root system, or rhizomes, two inches deep in the prepared soil. Do not over water your newly planted bamboo. They do not like wet soil. Let the soil dry out between waterings. Place a store-bought bag of mulch, which can be found at any garden store, around the bamboo plants. As the bamboo is growing, if you notice any insect problems, treat the plant with a chemical insect repellent. 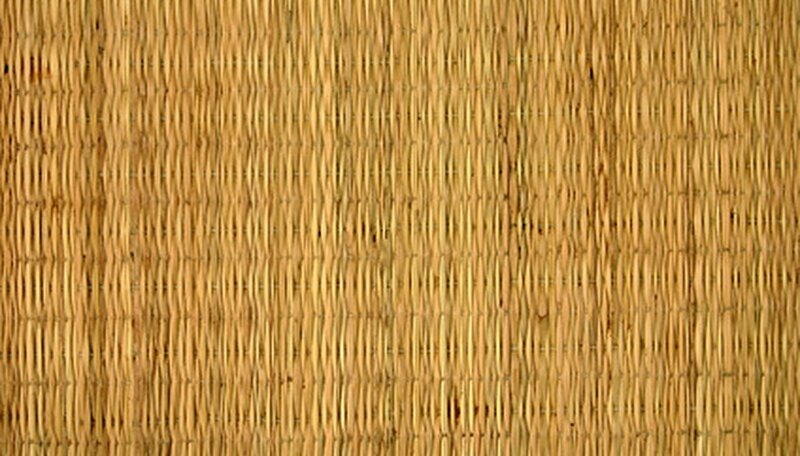 Bamboo is a grass not a wood, even though it is very popular in flooring. It reaches maturity in only three years, which makes it a renewable resource. Cut the bamboo canes back to 2 feet to make them easier to maneuver. Dig around the existing bamboo plant 4 to 5 feet in diameter and 2 feet in depth. Loosen the soil until you have a good view of the rhizomes. Choose a rhizome that is yellow with one or two culms attached to it. Cut off the rhizome from the mother plant at the neck using a sharp knife. Wrap the bamboo rhizome in a damp burlap sack. Plant it immediately in a well-drained pot filled with potting soil or in your yard. 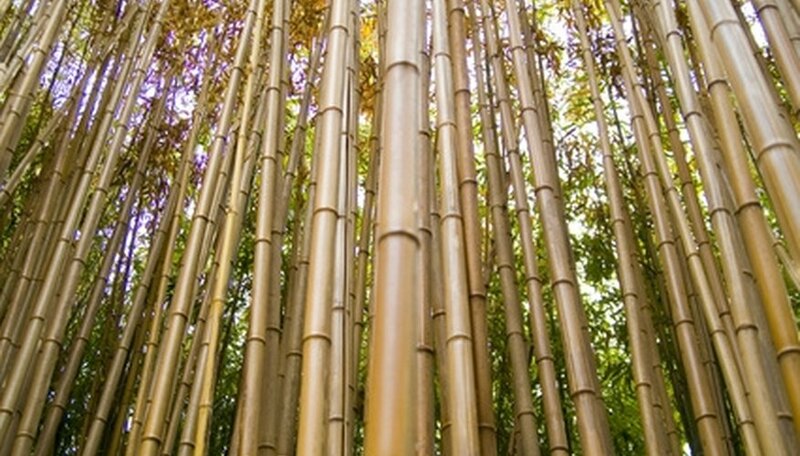 If planting in your yard, make sure the soil is drains well and the bamboo has access to full sun. Plant the bamboo as deep as the rhizome. Water the bamboo for five minutes and place mulch over the soil around the base of the plant. Keep the soil around the bamboo moist for one to two months until it is established. 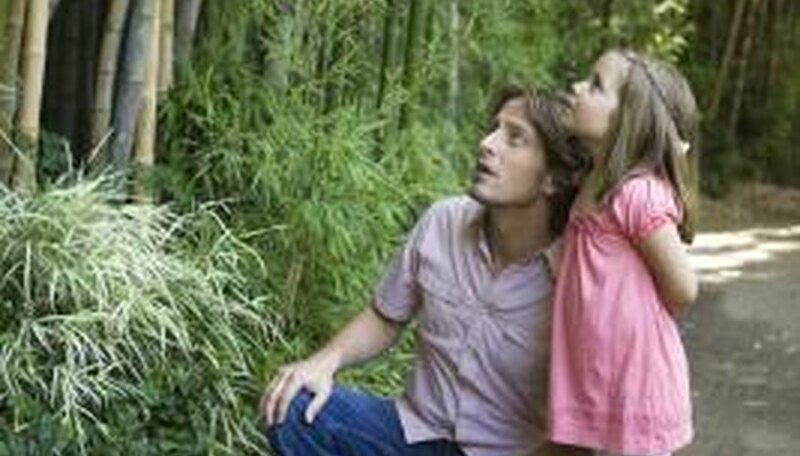 Focus on the bamboo that you want to keep in your yard. This will most likely be the original grove you planted. Dig down about two feet into the soil around the bamboo, creating a circular trench around it. Put in a plastic or metal barrier into the trench. It does not have to stick out too high. A few feet will do. This will keep the bamboo's rhizomes from spreading and growing new plants elsewhere. Trim and maintain the bamboo to keep it from growing out of the barrier. Any bamboo shoots that grow too close to it should be removed. Cut the bamboo shoots to a height of 6 inches using your garden shears. Apply the herbicide quickly to the shoots. You want to allow the sap that appears to soak up the herbicide, but the sap will quickly retreat into the bamboo shoots after you cut them. This will allow the herbicide to kill the roots of the plant. Pull out whatever dead bamboo shoots are there after the herbicide does its work. Cut down the shoots that have grown back to not more than a few inches. Cover the shoots with fertilizer that is high in nitrogen. Make sure the shoots are completely covered by it. Cover everything with a plastic sheet. Remove it after a few weeks, when the bamboo should be overheated and killed at the roots. Then you can dig up what's left to prevent future growth. According to Quindembo Bamboo Nursery, 90 percent of bamboo's appearance depends on having adequate moisture. Indoor bamboo also needs consistent, generous feedings with quick-release fertilizer that provides nitrogen, potassium and phosphorous. 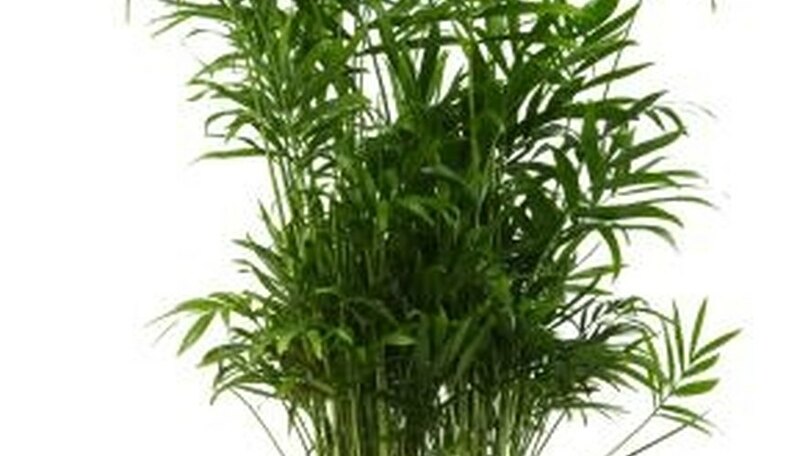 Green Green Plant Food is a liquid bamboo fertilizer designed specifically for lucky bamboo. The fertilizer contains acid, nitrogen, phosphate, potash, potassium and calcium phosphates for leaf color and healthy growth. Symptoms that indoor bamboo requires additional nutrition like Green Green Plant Food include yellowing of leaves and stalks, leaf die back and stem rotting. Although indoor bamboo can survive in water alone, it doesn't have the nutrition necessary for ultimate new growth. The Lucky Bamboo Shop suggests adding three to four drops of Green Green Plant Food every time you water. The site also suggests pre-mixing Green Green Plant Food with water. Green Green Plant Food is not safe for people and should always sit out of reach of children. Don't put indoor bamboo in direct sunlight or outside, as these conditions will burn the plant. Too much plant food and fertilizer will also burn the plant. Running bamboo spreads quickly, and grows without the strong, tall stalks of clumping bamboo. This type of bamboo is flexible and puts out long shoots that often require a trellis, wall or arbor for structural support. 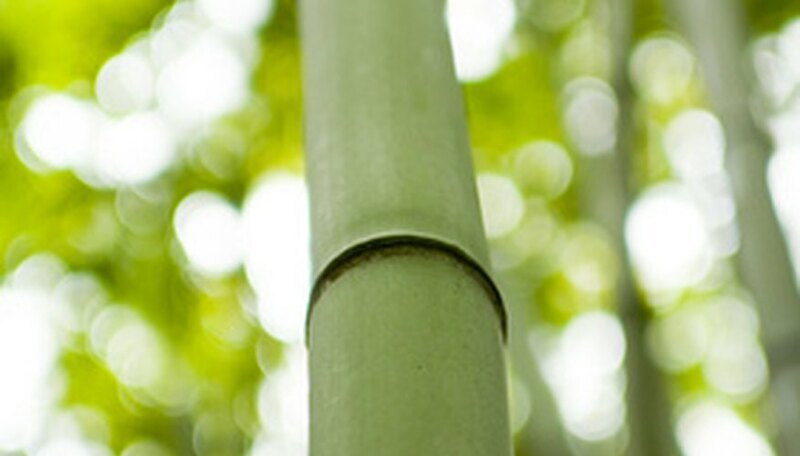 All bamboo plants require nutritional and foundational support at planting. Bamboo requires good drainage and nutrition, and does best in quick-draining soil and rich organic compost. It's important that bamboo rhizomes, or bulbs, be packed in without any air pockets around them at planting. Bamboo requires moist, supportive soil with good drainage at all times, and will rot if it's left in standing water. According to Quindembo Bamboo, 98 percent of a bamboo plant's success depends on watering and moisture. Quindembo recommends 40 inches of water a year for full bamboo support, divided into weekly waterings to supplement natural rainfall. Bamboo needs good nutritional support to thrive and grow. It does best with organic or 10-10-10 fertilizer every four to six weeks, but should never receive fresh manure, which will burn its roots. Another important aspect of bamboo support is division. These plants expand quickly, and may grow up to 20 feet in a single season. Gardeners should dig up and divide rhizomes every two to three years to give the plants space for continued growth. Cut the stalks from the bamboo. Stalks grow in clumps called groves, one plant connected below the ground by rhizomes, a kind of stem. Use sharp, clean pruning shears to cut the stalks from the bamboo. Cut the grove to ground level. With a spade or saw, cut pieces of the grove apart to remove all pieces above ground. Place stalks and grove pieces in an outside trash container. Water the soil around the plant until well-saturated; not soggy, but moist. Apply 2 circular inches of manure around the bamboo plant. Cover the manured area with mulch to retain moisture. Water and fertilizer cause new growth, required to properly kill the plant. Cut new growth from the plant when shoots emerge. Cut the plant to the ground every time new growth appears. Repeat cuttings exhaust the plant and will stop the plant from producing new shoots. Bamboo enjoys well-draining rich soils, so look for a potting soil that is well-draining, not sandy. Loamy soil is ideal, since this combines sand, clay and silt to hold moisture in to nourish the plant while still allowing adequate drainage. The American Bamboo Society recommends using mulch to naturally fertilize your bamboo. Consider adding organic mulch in addition to potting soil when growing bamboo in containers. They suggest any type of organic mulch. If you have sandy soil and want to grow bamboo, you will need to water the plant much more often. Bamboos in general need 1 gallon of water per 5 gallons of plant (based on the nursery container size), so plan accordingly. If you have heavier soil that does not drain well, you will need to water less often, but bamboo roots may get damaged over time in this type of soil. Decide what type of bamboo you want to grow outside. Since there are more than 1,200 types of bamboo, there is always one perfectly suited to the climate you live in. Some bamboo plants love hot weather, while others can tolerate temperatures below 0 degrees Fahrenheit. Choose a planting area that has well-drained soil that is good-quality (mix in some fertilizer and good-quality soil if it is not). You want this area to be consistently moist, whether it is from irrigation, a sprinkler system or water runoff. Make sure the ground temperature is above 40 degrees Fahrenheit before planting. Use a small shovel to dig a hole that is as deep as the container your bamboo came in. Since the plants can grow rapidly, you want the holes to be able to accommodate a size twice as wide, at least. Carefully put the bamboo in the holes, which should be spaced several feet apart for multiple bamboo plantings. Fill in the holes with soil and mulch. Water the bamboo thoroughly after planting. Continue to water the bamboo as necessary to keep the soil consistently moist but not soaked. Cut bamboo stalks narrower than 1 1/2 inches with pruning scissors. Cut larger stalks with pruning shears or a fine-toothed saw. Cut the bamboo from the garden when it is green; this will reduce splintering. Heat the bamboo before you cut the stalk further by placing it in hot water or in an oven. This will make cutting the stalk easier and reduce the chance of tearing or cracking. Place the bamboo stalk on a flat, sturdy surface. The stalk needs support to prevent cracking, bending and tearing of the bamboo fibers. Cut carefully into the bamboo with a utility knife, then use firm pressure to move the blade back and forth to get a clean, even cut. Do this until you have cut completely through the stalk.